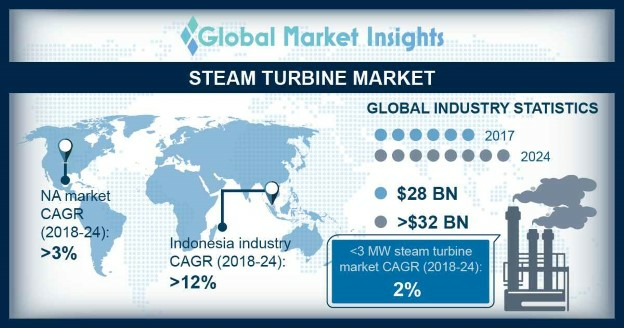 Steam Turbine Market size is set to exceed USD 32 Billion by 2024, as reported in the latest study by Global Market Insights, Inc. Rising focus toward expansion of generating capacity and resurgent economic growth across major countries will fuel the market growth. The ongoing expansion of thermal power generation along with a positive outlook toward the utilization of geothermal energy resources will boost the demand for large capacity steam turbines. Furthermore, efforts to reduce electricity supply demand gap will complement the business scenario. Growing inclination toward the adoption of energy efficient technologies along with regulatory norms to reduce carbon footprint will stimulate the market growth. Growing demand for reliable electricity along with positive outlook toward the adoption of combined cycle technology will further drive the industry growth. However, reduced investments across the coal fired systems and stringent government measures to reduce dependence on fossil fuel fired power generation may hamper the industry growth. <3 MW steam turbine market size is anticipated to expand over 2% by 2024. Positive outlook toward co-generation and geothermal energy utilization will drive the industry growth. Rapid industrialization and efforts toward energy optimization have significantly enhanced the demand for on-site power generation, which will enhance the product adoption in coming years. Indonesia market is anticipated to witness growth of over 12% by 2024. Low coal prices, along with government efforts to boost the domestic industrial output will thrust the product deployment in coming years. Ongoing investment toward enhancing baseload power generation capacity along with positive outlook toward adoption of supercritical & ultra-supercritical systems will further stimulate the business growth. Condensing steam turbine market in 2017, was over USD 17 billion. The turbine’s ability to extract maximum energy from steam makes it suitable for the thermal power generation. Ongoing investments in new generating capacity additions along with an increasing electricity demand across industries will favor the industry growth. Furthermore, rising focus toward cogeneration and rising utilization of non-conventional energy resources will positively influence the industry landscape. Steam turbine market share from biomass in 2017, was over USD 1 billion. Growing adoption of combined heat & power and captive power generation systems will strengthen the product adoption. Furthermore, rising focus toward energy optimization and enhancement of generation efficiency will favor the expansion of biomass-based power generation capacity. South Africa market will witness a significant growth owing to favorable government policy toward strengthening and development of industrial sector. Growth of domestic manufacturing industry has resulted in increased demand for electricity which in turn will complement the business landscape. Ongoing investments toward power generation and growing geothermal capacity will further complement the industry growth. Notable players active in the global market include Siemens, Bharat Heavy Electricals Limited, Harbin Turbine, Kawasaki Heavy Industries, Mitsubishi Hitachi Power Systems, Toshiba, Eliott Group, TurboTech, General Electric, Mitsui, Man Diesel & Turbo, Ansaldo Energia, Fuji Electric, Doosan Skoda Power and Dongfang amongst others.